Scientists have discovered seven Earth-sized planets, so tightly packed around a dim star that a year there lasts less than two weeks. Scientists have discovered seven Earth-sized planets, so tightly packed around a dim star that a year there lasts less than two weeks. The number of planets and the radiation levels they receive from their star, TRAPPIST-1, make these worlds a miniature analogue of our own Solar System. The excitement surrounding TRAPPIST-1 was so great that the discovery was announced with an article in Nature accompanied by a NASA news conference. In the last two decades, nearly 3,500 planets have been found orbiting stars beyond our Sun, but most don’t make headlines. How likely are we really to find a blue marble like our Earth among these new worlds? We still know little about these planets with certainty, but initial clues look enticing. All seven worlds complete an orbit in between 1.5 and 13 days. So closely are they huddled that a person standing on one planet might see the neighbouring worlds in the sky even larger than our Moon. The short years place the planets closer to their star than any planet sits to the Sun. Happily, they avoid being baked by TRAPPIST-1 because it is incredibly dim. TRAPPIST-1 is a small ultracool dwarf star with a luminosity roughly 1/1000th that of the Sun. Comparing the two at Wednesday’s news conference, lead author of the Nature paper, Michaël Gillon, said that if the Sun were scaled to the size of a basketball, TRAPPIST-1 would be a puny golf ball. The resulting paltry amount of heat means that three of the seven TRAPPIST-1 planets actually receive similar amounts of radiation as Venus, Earth and Mars. This alternative Solar System does look like a compact version of our own, but does TRAPPIST-1 include an Earth 2.0? Here’s the good news first. The seven siblings are all Earth-sized, with radii between three quarters and one times that of our home planet and masses that range from roughly 50% to 150% of Earth’s (the mass of the outermost world remains uncertain). 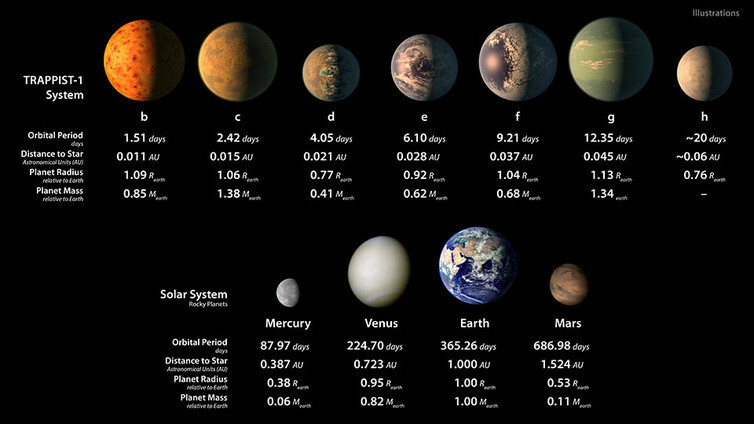 Because all are smaller than 1.6 times Earth’s radius, the seven TRAPPIST-1 planets are likely to be rocky worlds, not gaseous Neptunes. TRAPPIST-1d, e and f are within the star’s temperate region — aka the “Goldilocks zone” where it’s not too hot and not too cold — where an Earth-like planet could support liquid water on its surface. The orbits of the six inner planets are nearly resonant, meaning that in the time it takes for the innermost planet to orbit the star eight times, its outer siblings make five, three and two orbits. Such resonant chains are expected around stars where the planets have moved from where they originally formed. This migration occurs when the planets are still young and embedded in the star’s gaseous planet-forming disc. As the gravity of the young planet and the gas disc pull on one another, the planet’s orbit can change, usually moving towards the star. If multiple planets are in the system, their gravity also pulls on one another. This nudges the planets into resonant orbits as they migrate through the gas disc. The result is a string of resonant planets close to the star, just like that seen encircling TRAPPIST-1. Being born far from the star offers a couple of potential advantages. Dim stars like TRAPPIST-1 are irritable when young, emitting flares and high radiation that may sterilise the surface of nearby planets. If the TRAPPIST-1 system did indeed form further away and migrate inwards, its worlds may have avoided getting fried. Originating where temperatures are colder would also mean the planets formed with a large fraction of ice. As the planets migrate inwards, this ice could melt into an ocean. This notion is supported by the estimated densities of the planets, which are low enough to suggest volatile-rich compositions, like water or a thick atmosphere. Since our search for extraterrestrial life focuses on the presence of water, melted icy worlds seem ideal. But this may actually bode ill for habitability. While 71% of the Earth’s surface is covered by seas, water makes up less than 0.1% of our planet’s mass. A planet with a high fraction of water may become a water world: all ocean and no exposed land. Deep water could also mean there’s a thick layer of ice on the ocean floor. With the planet’s rocky core separated from both air and sea, no carbon-silicate cycle could form – a process that acts as a thermostat to adjust the level of warming carbon dioxide in the air on Earth. If the TRAPPIST-1 planets can’t compensate for different levels of radiation from their star, the temperate zone for the planet shrinks to a thin strip. Any little variation, from small ellipicities in the planet’s orbit to variations in the stellar brightness, could turn the world into a snowball or baked desert. Even if the oceans were sufficiently shallow to avoid this fate, an icy composition might produce a very strange atmosphere. On the early Earth, air was spewed out in volcanic plumes. If a TRAPPIST-1 planet’s interior is more akin to a giant comet than to a silicate-rich Earth, the air expelled risks being rich in the greenhouse gases of ammonia and methane. Both trap heat at the planet’s surface, meaning the best location for liquid water might actually be in a region cooler than the “Goldilocks zone”. Finally, the TRAPPIST-1 system’s orbits are problematic. Situated so close to the star, the planets are likely in tidal lock – with one face permanently turned towards the star – resulting in perpetual day on one side and everlasting night on the other. Not only would this be weird to experience, the associated extremes of temperatures could also evaporate all water and collapse the atmosphere if the planet’s winds are unable to redistribute heat. Also, even a small ellipticity in the planets’ seemingly circular orbits could power a second kind of warmth, called tidal heating, making the planets into Venus-like hothouses. Slight elongations in the planet’s path around its star would cause the pull from the star’s gravity to strengthen and weaken during its year, flexing the planet like a stress ball and generating tidal heat. This process occurs on three of Jupiter’s largest moons whose mildly elliptical paths are caused by resonant orbits similar to the TRAPPIST-1 worlds. In Europa and Ganymede, the flexing heat allows subsurface liquid oceans to exist. But Jupiter’s innermost moon, Io, is the most volcanic place in our Solar System. If the TRAPPIST-1 planets’ orbits are similarly bent, they could turn out to be sweltering. So how will we ever know what the TRAPPIST-1 planets are really like? To investigate the possible scenarios, we need to take a look at the atmosphere of the TRAPPIST-1 siblings. TRAPPIST-1 was named for the Belgian 60cm TRAnsiting Planets and Planetesimal Small Telescope in Chile that detected the star’s first three planets last year (it also happens to be the name of a type of Belgian beer). As the name suggests, both the original three worlds and four new planetary siblings were discovered using the transit technique; the tiny dip in starlight as the planets passed between the star and the Earth. Transiting makes the planets excellent candidates for the next generation of telescopes with their ability to identify molecules in the planet’s air as starlight passes through the gas. The next five years may therefore give us the first real look at a rocky planet with a very different history to anything in our Solar System. Thomas Zurbuchen, associate administer of the Science Mission Directorate at NASA, declared the discovery of TRAPPIST-1 as, “A leap forward to answering ‘are we alone?’”. But the real treasure of TRAPPIST-1 is not the possibility that the planets may be just like the one we call home; it’s the exciting thought that we might be looking at something entirely new.